While your private student loan seemed like a good idea when you were pursuing a degree, now it might feel like an unbearable weight — especially if you didn't get the job or paycheck you were hoping for after graduation. If you are struggling to pay your student loans, know that you are not alone: American grads share over $1.48 trillion in student loan debt, with a delinquency rate of 11.2 percent. Private student loans add an extra layer of difficulty for borrowers. 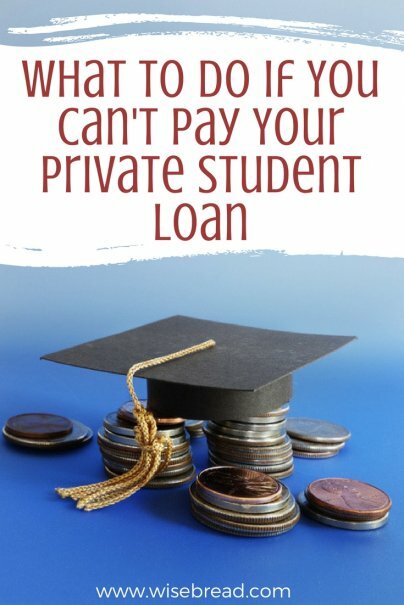 While federal student loans offer various repayment programs to those struggling to make payments, private loans notoriously have less leeway. Are you paying a lot of interest for your student loan? Get quotes from private student loan lenders to see if you can land a lower interest rate. Decreasing your interest rate by 1 percent might not save you a lot each month, but it can save you thousands over the life of your loan. If you can't find room in your budget for your student loan payments, it might be time to get a new budget. Take a hard look at what expenses can be cut. This can be a painful exercise, but if it means being able to stay current with your student loan bills, it is worth it. Cut the fun stuff from your budget first, like coffee runs and shopping trips. Downsize your cellphone and cellphone plan and cancel any monthly subscriptions. This includes magazines, Netflix, gym memberships, and anything else you can live without. If you still cannot afford your student loan payments after cutting out the fun stuff, it may be time to adjust your way of living altogether. As hard as it may be, consider ditching your car with a car payment for an older vehicle that can be bought with cash. Live with a roommate or move back home temporarily while you get ahead on your debt.